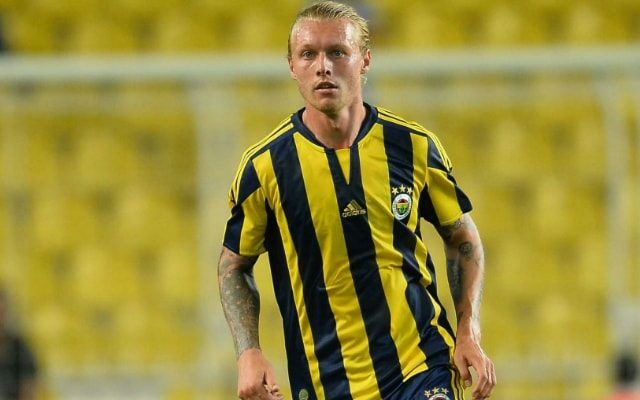 Antonio Conte is plotting a £16 million move for Fenerbahce centre-back Simon Kjaer, report The Sun. Chelsea’s defence is already one of the tightest in the league. During their 13-match winning streak, the Blues conceded just four goals and kept ten clean sheets in the process. However, last week’s defeat at the hands of Tottenham exposed pitfalls in Conte’s back-line. The Italian could look to sign defensive reinforcements this month, and according to The Sun, Kjaer is high on his shopping list. The Sun claim that Kjaer is seen by Conte as ideal for his three-at-the-back system, and will slot straight into the side. They believe that Fenerbahce are not keen on losing one of their prize assets but will negotiate with Chelsea, who are thought to be preparing a £16 million offer. Conte’s side are five points clear at the top of the Premier League and may see this as a genuine opportunity to win it if they invest this month.